It’s holiday shopping season and many of us are on a budget. If you want to save money and still get a gift someone will love, one great option is to buy discounted gift cards to their favorite store or restaurant. In fact, you can buy discounted gift cards online throughout the year to save money on stores you frequent. Savings on discounted gift cards can vary. If you buy them from an online retailer, you can expect to save between five and ten percent. If you get them at a store like Costco, you may see savings around 20 percent or more. For example, if you buy a gift card with a $100 value, you may be able to purchase it for $80. Depending on what gift cards you buy, and where, you may find significant savings opportunities. If you’re ready to learn where to buy discounted gift cards, use the list below to get started. CardPool is a traditional gift card reseller. Depending on the gift card you want to buy, you may be able to buy a physical gift card or an electronic gift card. Discounts will vary depending on the type and format of the gift card you purchase. CardPool, like many other discount gift card resellers, works like a search engine. You search by face amount, amount of discount, and retailer. This makes it easy to find a cheap gift card to meet your needs. Cardpool guarantees that the gift cards sold on their site are valid at the merchant and for the dollar amount specified on your order for one year from the date of your purchase. Their guarantee is subject to a $1,000 lifetime maximum, and does not cover issuers or retailers that are no longer honoring gift cards, including those companies that go bankrupt. Raise is another a gift card reseller offering both physical and electronic gift cards. They also offer a one-year money back guarantee that covers cards that aren’t active, have an inaccurate balance, are delivered as a different brand than ordered, or cards that aren’t received within 30 days from the date of purchase. The guarantee covers the purchase price of the card. If you happen to receive a gift card that is inactive, they refund the purchase price. Raise offers a wide range of discounted gift cards from online retailers to brick and mortar stores to even Airbnb! Gift Card Granny is a third gift card reseller website. However, Gift Card Granny works as a marketplace that allows you to buy gift cards from many resellers. Gift Card Granny promotes their service as a search engine for gift cards that lets you find discounted gift cards from various platforms. This allows you to find the perfect gift card for you. Gift Card Granny also has a loyalty program that lets you earn “Granny” points from certain resellers. These points can be used to earn free eGift cards. Cards sold on the marketplace are only provided by trusted partners that meet Gift Card Granny’s consumer protection standards. Groupon and LivingSocial are both owned by the same company and offer similar types of deals. These websites occasionally let you buy discounted gift cards to different retailers or restaurants. However, they also offer plenty of other great deals for local businesses. While the offers may not technically be gift cards, they still offer a big bang for your buck when compared to regular prices. One of our favorite Costco money saving hacks is buying discounted gift cards at the store or online. The discount will vary from gift card to gift card, but you can expect to see discounts for at least 20 percent, providing significant savings. Sometimes there are even deeper discounts, but those will vary based on the store and the current offers available. You do need to be a Costco member to shop in store and online. GiftCards.com offers a wide range of gift cards from all sorts of stores. They also offer the option to buy Visa and Mastercard gift cards. Unfortunately, the majority of the gift cards on GiftCards.com are sold at full price. However, they do offer discounted gift cards from certain brands. Their inventory changes on a regular basis, but you can save up to 25 percent on your gift card purchase. Interesting fact: the discount gift card portion of the website is run through Cardpool. If you’re willing to do a little bit of work, there are a number of websites and apps you can use to earn discounted and even sometimes free gift cards. Usually, you have to earn cash back, points or some other form of digital currency which you can later exchange for a gift card of your choice. Ibotta is an app that allows you to earn cash back based on items you buy at the grocery store or one of their 350 participating retailers. All you have to do is download the app, add offers to your account before you shop, then take pictures of the receipt showing you bought the items. After that, you receive the cash back the offer promised. However, instead of opting for cash back, you can opt for free gift cards. Check out our Ibotta review to get a complete breakdown of how the app works. Shopkick is an app you can use to earn points when shopping. The points you earn, called kicks, can be redeemed for the gift card of your choice. You can earn kicks by walking into stores, scanning barcodes of certain products, making purchases with a linked card, making a purchase and submitting a receipt, visiting online stores, viewing online products, making online purchases, and watching videos. The app is available for both Android and iOS devices. Shopkick operates by GPS, so you can even earn kicks by simply walking into a store. Once you earn enough points, you can browse their gift card selection to earn free gift cards. If you don’t earn enough points to get free gift cards, you can use your points to get discounted gift cards. For instance, Swagbucks normally charges 2,500 Swagbucks points for a $25 Amazon gift card but sometimes offers a 12 percent discount. This means you can get the gift card for 2,200 Swagbucks points. Ebates allows you to earn cash back on the online purchases you make using their shopping portal. To do so, you need to sign up for an Ebates account. Then, go to the Ebates website and click through their links to a retailer’s website before you go shopping. Doing so allows the retailer to identify that Ebates referred you, which also allows you to earn cash back. When it’s time to get your cash back check, Ebates will often send you an email offering a larger cash out amount if you opt for a gift card instead. The offers vary each quarter, but it’s a great way to get a higher value gift card rather than cash back. Check out our Ebates review for a full breakdown of the service. You won’t get rich taking surveys online, but they can be a great way to monetize your downtime. Many of the top paid survey sites let you redeem earnings for free gift cards, often at a greater value than redeeming for cash. Below are a few of the best options. Survey Junkie is one of the best survey sites to earn cash or gift cards because it’s so simple to use. It started in 2005, and has over three million active members. It’s easy to start earning money with Survey Junkie. You open an account, fill out a quick profile, and start taking surveys. Once you accrue 1,000 points, which is equivalent to $10, you can start redeeming points. You can redeem cash via PayPal, or get free gift cards from a variety of retailers like Amazon or Walmart. Survey Junkie lets you take surveys on your smartphone or desktop. All you need is access to the Internet to use the Survey Junkie platform. Check out our Survey Junkie review to read more about how the platform works. Pinecone Research is one of the highest paid online survey sites. They pay $3 per completed survey, and they also pay you $3 when you open an account. Pinecone specializes in product testing over traditional surveys since they want to test products before they make them publicly available. You can redeem points for cash or e-gift cards, and every 100 points equals $1. Ipsos i-Say is one of the oldest online survey sites in the market. The company started in 1975 and while they specialize in political-based surveys, they offer plenty of other surveys as well. What we love about Ipsos i-Say is their low minimum redemption amount. You can start redeeming rewards once you hit 500 points, which equals $5. You can redeem points for free gift cards from retailers like Amazon. Getting discounted or free gift cards provides significant savings. There are a few things you need to know, though. Some vendors may also offer the option to print off the gift card. Keep the type you get in mind, especially if you’re giving the gift card as a present. Digital gift cards are typically free and you can receive them within 24 hours. Physical gift cards, on the other hand, have delays due to mailing. You may also pay a fee to process physical gift cards. As you can imagine, there is the potential for fraud when buying discounted gift cards. That’s why many resellers offer some sort of guarantee on the gift cards they sell. Make sure you investigate any guarantees offered by resellers and use the gift card balances in full before the guarantee expires. Some fraudsters that sell gift cards to discount gift card reseller websites are smart and wait until the guarantee has expired to try to empty the balance of the gift card. If you leave a balance on a gift card after the guarantee expires and the balance disappears, you have no recourse and will lose the remaining balance. Whether you buy a discounted gift card or pay full price, it’s important to know the redemption policies of the specific retailer. The last thing you want is to buy or receive a gift card and have problems redeeming it. The best policy when getting discounted gift cards is to check the redemption policies directly with the retailer. Some may have a limited window while others may not allow you to redeem gift cards online. Many of the above platforms let you see their redemption terms, though some may not. The best way to protect yourself is to go directly to the retailer to see what they allow for redemption. What kind of retailers offer gift cards? The above list scratches the surface. If you have a favorite store or restaurant, it’s likely they offer gift cards. Finding discounted gift cards for them is a great way to save money on items or services you were already planning on buying. Now that you know where to look to buy discounted gift cards online, make sure you compare guarantees and prices to find the best place to get ones you want. You may find one website offers the best price on the Walmart gift card you want and another offers the best price for the Target gift card you want. If the discounts are large enough, it may make sense to order the discounted gift cards separately. Just don’t let things get so out of hand that you’re wasting time to save a few pennies. Where do you go to buy discounted gift cards? Do you like to give gift cards as presents, or do you think they’re tacky? What are other ways you like to save on giving gifts? 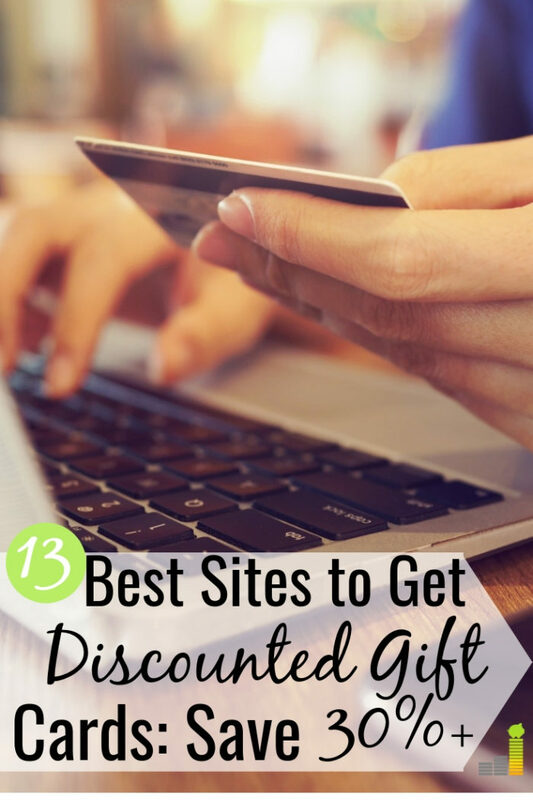 The post 13 Best Places to Buy Discounted Gift Cards Online appeared first on Frugal Rules.